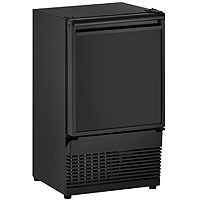 This Compact and Convenient 1000 Series BI95B-00A Black Cabinet Ice Maker by U-Line is the perfect ice maker for residential or small commercial use. With its streamlined style and ADA compliance this Built-In Ice Maker will fit perfectly under your counter! This Compact Ice Maker measures at 25 1/6"H x 13 15/16"W x 17"D and can store up to 12 lbs. of ice on a daily basis. Unit can produce ice at the rate of 23 lbs. The ice that it produces is of crescent shape that measures at 1/2"W x 3/4"H x 2-1/2"L. Ice maker uses less than three gallons of water for approximately 22 lbs. of ice and minimal electricity. Unit Features a Mechanical Dial Control that controls the temperature within the unit. The BI95B-00A only requires a 1/4" outside diameter water line connection. With no drain required, this Ice maker is very easy, convenient, and inexpensive to install. This unit does accept a 1/4" Flat or Raised Insert Cusom Door Panel.